We will pick you up from Dahab hotel then transfer to Sharm El Sheikh airport to fly to Luxor. You will be transferred upon arrival to explore the Valley of the Kings, Temple of queen Hatshepsut, Memnon Colossi and of course the majestic Karnak Temple then fly back to Dahab. 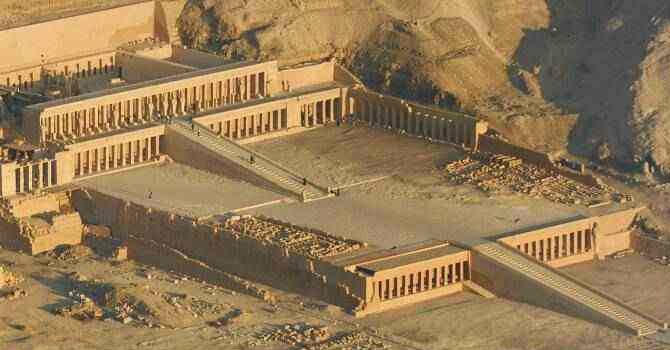 The Valley of Kings is the place where kings of the new kingdom between 18th and 20th dynasty been buried. Most of their tombs are cut into the limestone mountains with same pattern of the traditional tomb: 3 corridors, an antechamber & sarcophagus chamber. Hatshepsut Temple is situated in the west bank of the river Nile in Luxor city, it was built and dedicated to the powerful queen of Egypt, the only female ruler that ascended the throne of ancient Egypt for about 21 years. Karnak Temple is the most impressive worship temples in ancient world and the biggest temple complex ever built. The temple represents a series of achievement by several generations of ancient builders. Luxor Temple was the center of the most important festival in ancient Egypt, established by Amenhotep III & Rameses II. Its main purpose was as seat for the ceremonies of Opt festival to harmonize the human aspect of the ruler with the divine office.